Play dough has always been a tried and true way to keep my kids occupied, It’s fun, creative, and so open-ended. 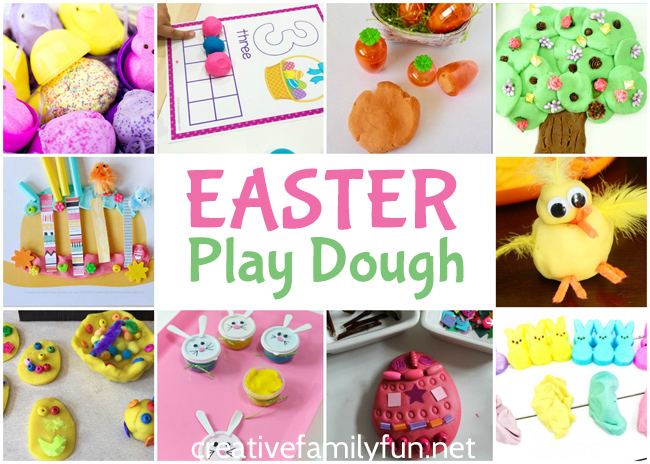 That’s why I love all of these great Easter play dough ideas. It might be a fun new recipe or a great creative invitation. They’re all so different and your kids will love them. 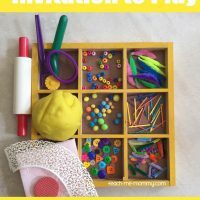 Whether you’re looking for some fun printable play dough mats, a fun learning activity, or you just have an overabundance of Easter candy, you’ll find some great ideas here. Check out the list and find a few ideas to try. They all look like so much fun! 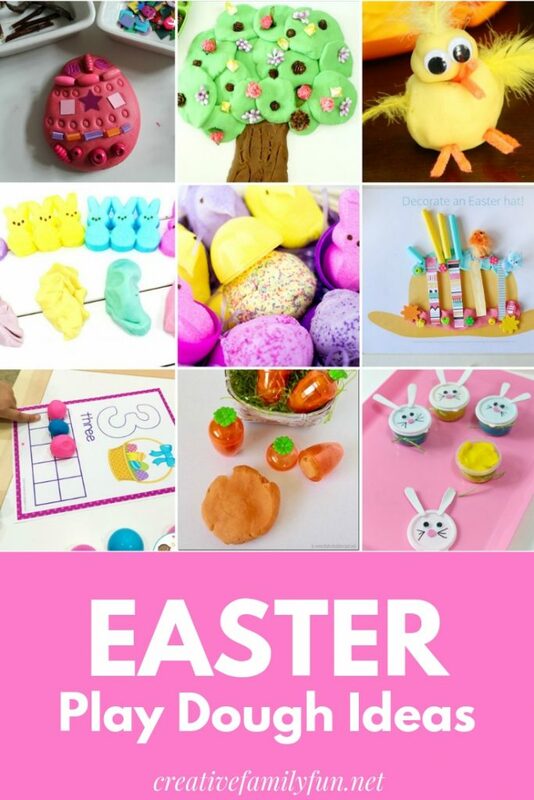 Have some springtime fun with these awesome Easter play dough ideas for kids. Turn this sweet Easter treat into a fun play dough with this recipe. 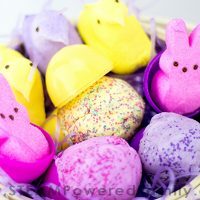 You can also turn Peeps into a fun (and edible) glittery play dough. 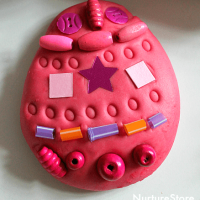 Pull out some fun beads and other loose parts to decorate play dough Easter Eggs. Practice counting with these fun printable Easter counting mats. 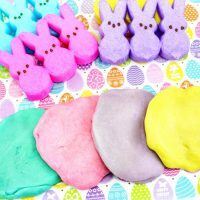 These Easter Bunny play dough treats would be a fun little gift to give. 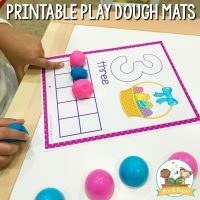 Have fun creating with these printable play dough mats. 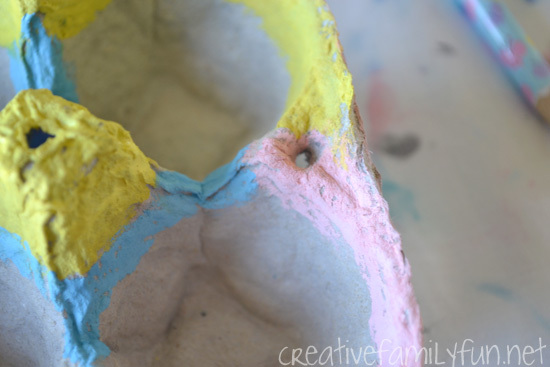 Your kids will have fun making Easter eggs with this play dough invitation. 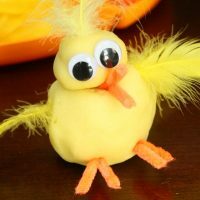 Make cute play dough chicks with this fun idea. Have fun creating with this orange carrot play dough recipe. 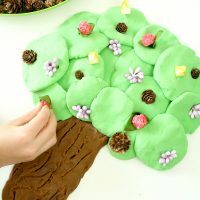 Make beautiful spring trees with this play dough invitation. So, what do you think? Which of these fun Easter ideas are you going to try? Do you want to do more activities with your family? I recently found myself staring at a pile of egg cartons and wondering how we could use them. Certainly there’s an Easter craft project we could try? What could we do? After a few moments of creative thinking, I had an a-ha moment. They would be perfect for making a cute little Egg Carton Easter Basket or two. This project takes very few supplies, it’s easy to prep, and it’s a lot of fun to make. 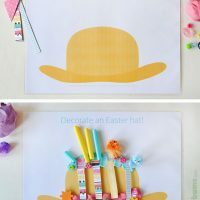 In fact, you probably already have everything you need to get started on this easy egg carton Easter craft. So, go grab your supplies and let’s get started crafting. Disclosure: CraftProjectIdeas.com sent us some of the supplies we used in this craft. All ideas are our own. There are Amazon Affiliate and other affiliate links in this article which means, at no additional cost to you, we could receive compensation for our recommendations. You can read our full disclosure policy on our Disclosure Page for more details. We divided an egg carton into sections of four cups apiece. The egg cartons we have tear easily. If you don’t have the same type of carton, you may have to get out the scissors. We each took a section of the egg carton and started painting. I got out as many pretty pastel colors of paint as I had, but feel free to use any color. Try stripes, polka dots, or just solid colors. Any pattern will look pretty on the baskets. While waiting for the paint to dry, we twisted two different colors of pipe cleaner together. Once they were twisted, we curved them into a u-shape to make a handle. This next step needs to be done by an adult. If you’re working with a large group, you can do this step before painting. Before we put in the handle, I used the sharp pencil to poke a hole in each side of the egg carton. 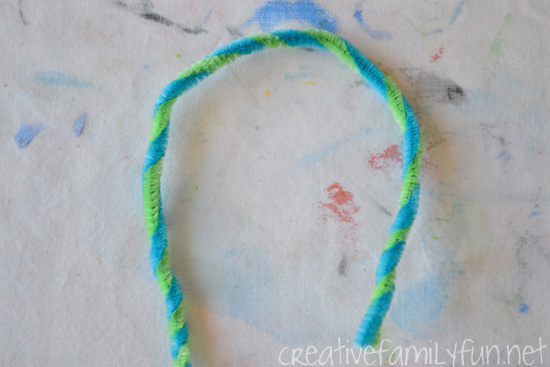 We then put the ends of the pipe cleaners into each hole, curving up the ends and twisting it around itself. That’s it. You’ve finished your egg carton Easter basket! 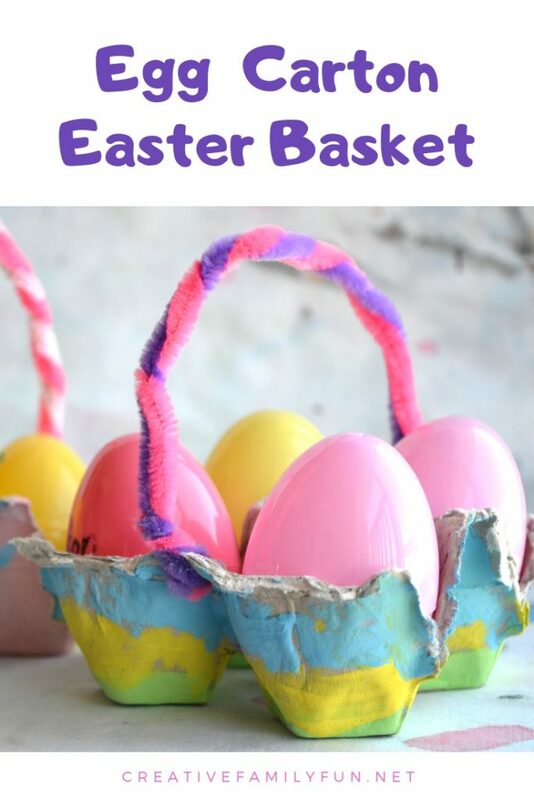 This Easter basket craft was so simple and fun. We filled our baskets with plastic eggs and added them to our Easter decorations. They’re so pretty. 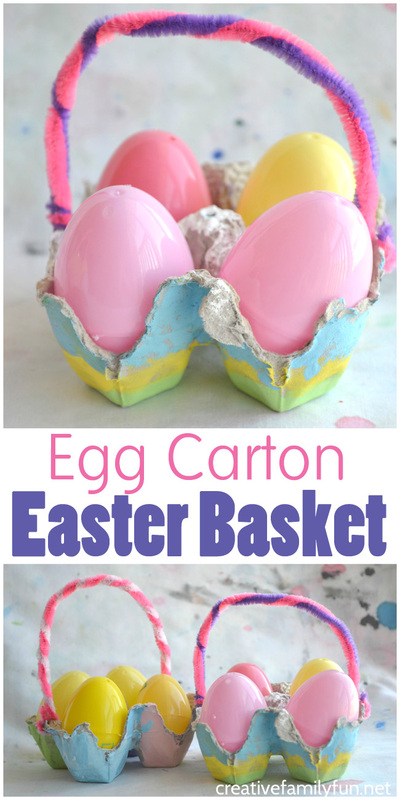 If you find yourself with a few extra egg cartons, turn them into Easter baskets! Did you buy extra eggs to dye for Easter? Yep, me too! And now, after all the fun of dying Easter egg, I’ve got an extra egg carton (or two or three). So what should we do about those extras? 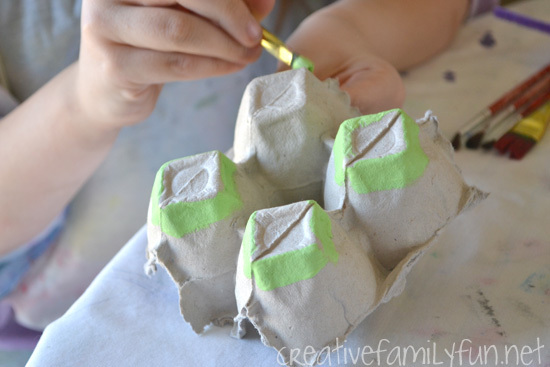 How about making some fun egg carton Easter crafts. 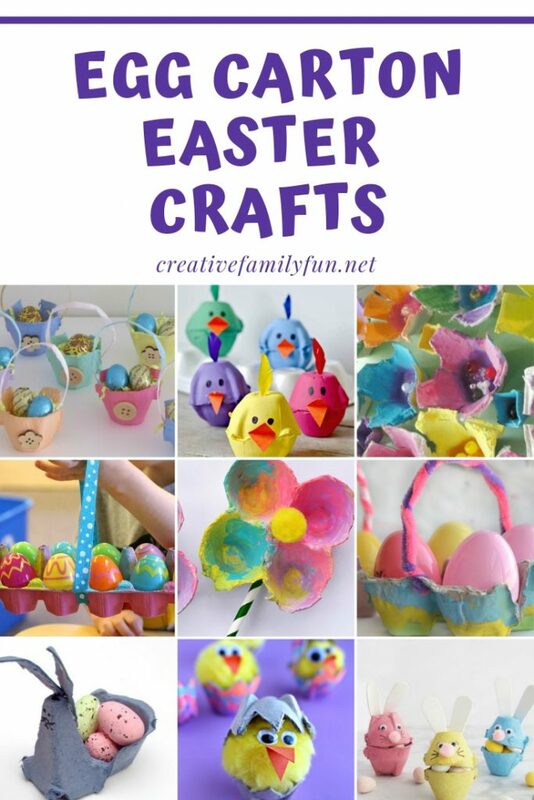 Here are some great crafts you’ll love, from bunnies and baskets to chicks and flowers. Which one is your favorite? I don’t know which one I like best. We may have to make them all! Use a portion of an egg carton to make our simple Egg Carton Easter Basket that will hold four Easter eggs. 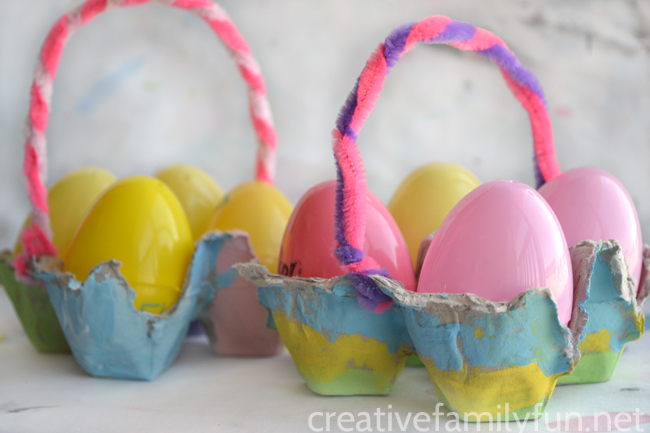 Or, you can use the entire egg carton to make a larger basket like this one from Fun-A-Day. 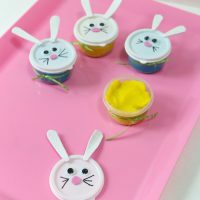 You can also make this other Easter basket version using single egg cups like these from Learning 4 Kids. Cut up an egg carton to make these super-cute Egg Carton Chicken Egg Cups from Red Ted Art. 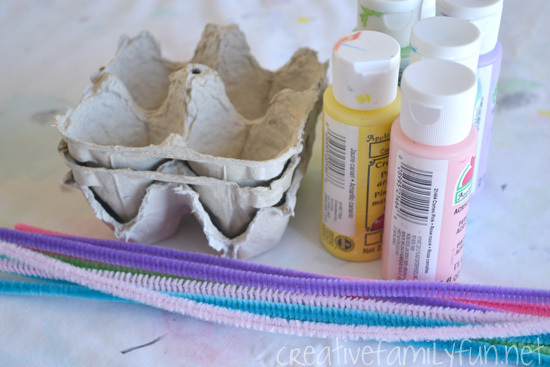 Make these colorful and cute Spring Chick Egg Carton Crafts from Typically Simple. Use pompom chicks to create these Egg Carton Hatching Chicks from Crafty Morning. 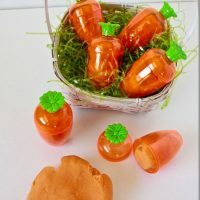 These cute open and close Egg Carton Easter Bunnies from The Best Ideas for Kids can also hold a little bit of candy. Or, you can make a cute Easter Bunny like this from Red Ted Art that can hold candy or an Easter egg. Use a large portion of an egg to make a pretty Easter Cross from Teach-Me-Mommy. Make a beautiful bouquet of Egg Carton flowers like these from Kitchen Counter Chronicles. Or, use egg cartons and straws to make these cute flowers from I Heart Crafty Things. Make beautiful bluebells out of egg cartons like these from Buggy and Buddy. 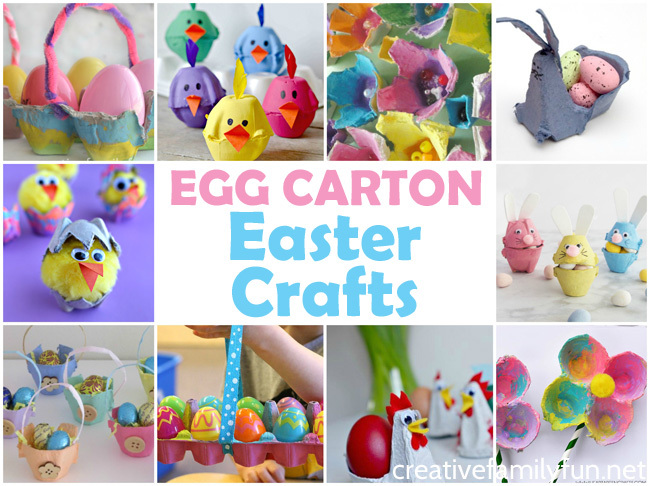 Which of these egg carton Easter crafts do you want to make with your kids? We love to combine a craft with a book. 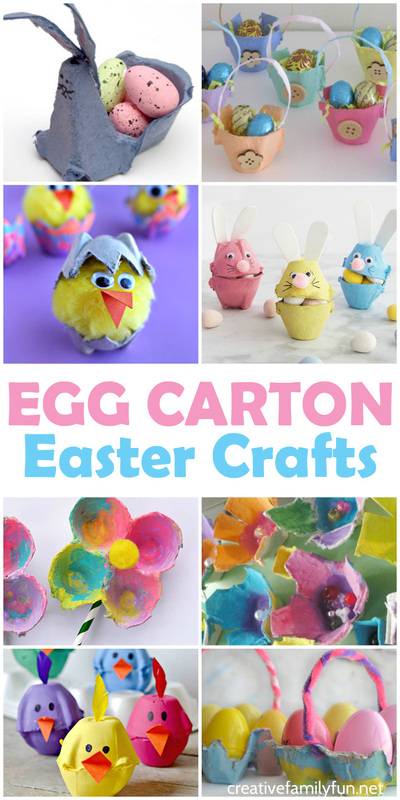 So, when you’re making one of these awesome Easter crafts from egg cartons, choose one of these fun Easter books for a perfect craft afternoon. Have you ever worked with arrays? 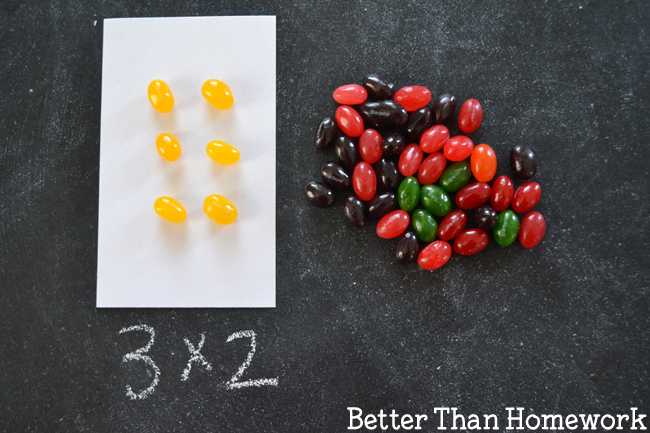 It’s a great way to visualize multiplication. And it’s another one of those things I didn’t learn in school, but my children are. I’m glad they are! Arrays are a great way to describe a multiplication problem and help you “see” how to get the answer. 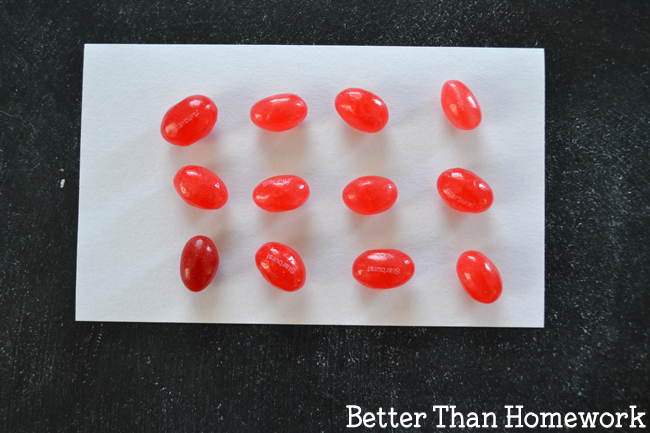 So, today we’re grabbing our Easter candy and having some fun with jelly bean arrays. How do you use arrays in multiplication? First of all, let’s define an array. Quite simply, it’s a visual representative of a multiplication problem (at least in our case) using objects arranged in rows and columns. Take the multiplication problem, 2 x 4. The first number, two, represents the number of rows. The second number, four, represents the number of columns. So, for 2 x 4, we would create two rows with four objects each. What else can you see? In the above photo, you’ve got three rows and four columns. It represents 3 x 4. Or, 4 + 4 + 4. Can you see that? And the answer to both of those math problems is twelve. Arrays can tell you a lot! 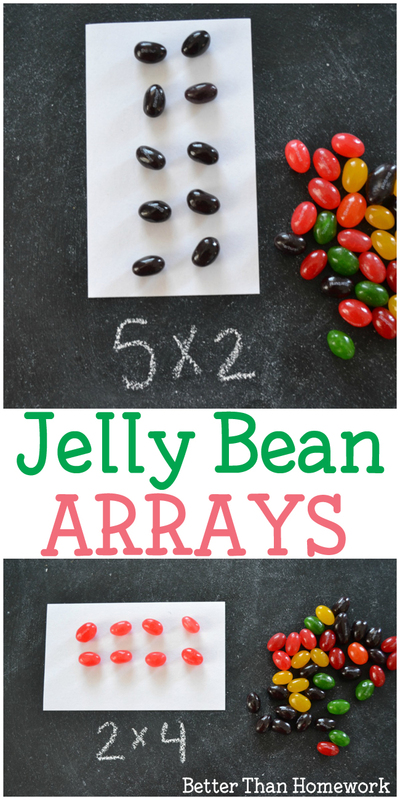 Now that we have an understanding of arrays, let’s grab our jelly beans and have some fun. 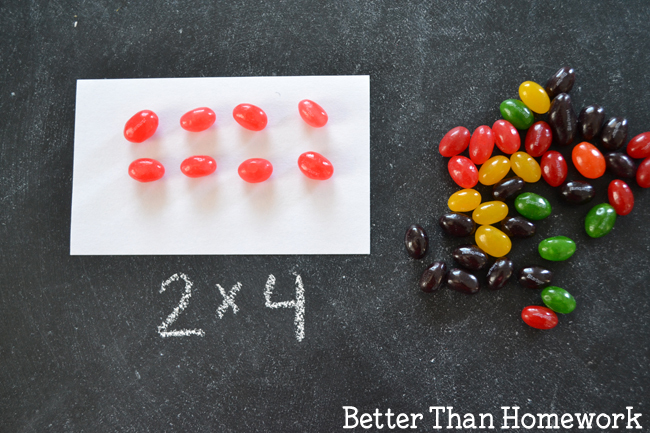 Our set-up was simple, I just used an index card to display my arrays and grabbed a pile of jelly beans. Note: You can do this any time of the year. Just use M&Ms or Skittles instead of jelly beans. The only other thing you need are some multiplication problems. How do you solve 3 x 2? Let’s flip the problem around? Would 2 x 3 look the same as 3 x 2? The answer is the same, but the array would look different. 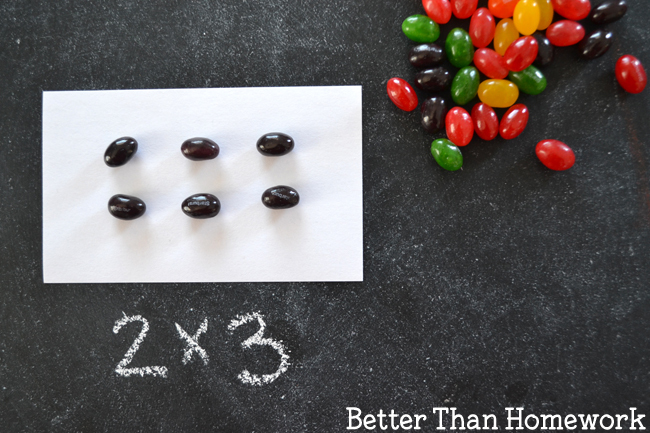 To make an array for 2 x 3, you’d have 2 rows with 3 jelly beans in each row. 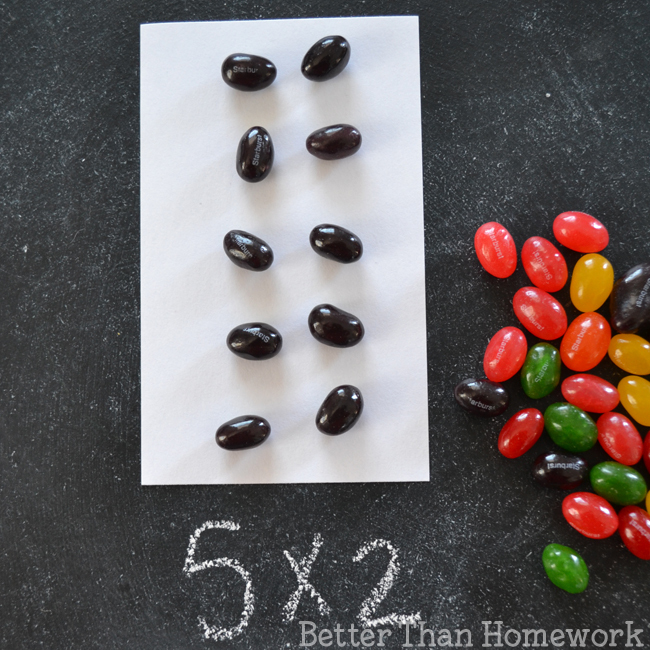 Keep using jelly bean arrays to work on all your multiplication problems. I love how this helps you see exactly how to solve a multiplication problem. This is such a great math tool! If you enjoyed working with Jelly Bean Arrays, the above photo is perfect for sharing on Facebook or you can save the photo below on Pinterest. What words remind you of Easter? I can think of a few, like bunny, bonnet, and eggs. Oh, and jelly beans, jelly beans too! 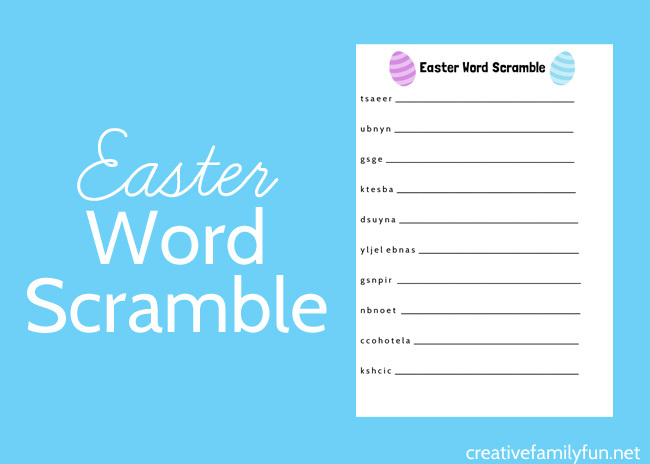 You can find those words and more on this fun Easter word scramble printable. This is such a fun and quick activity for anyone who loves word games. We all need fun and quick activities, right? I just love a good word scramble, don’t you? They’re fun, get the brain working, and take absolutely no prep time. Just print and find a pencil! Take one of these along the next time you’re sitting in a waiting room, print out enough for all the kids to do while they’re waiting for Easter dinner, or even print enough for the classroom. Word scrambles make great time fillers. 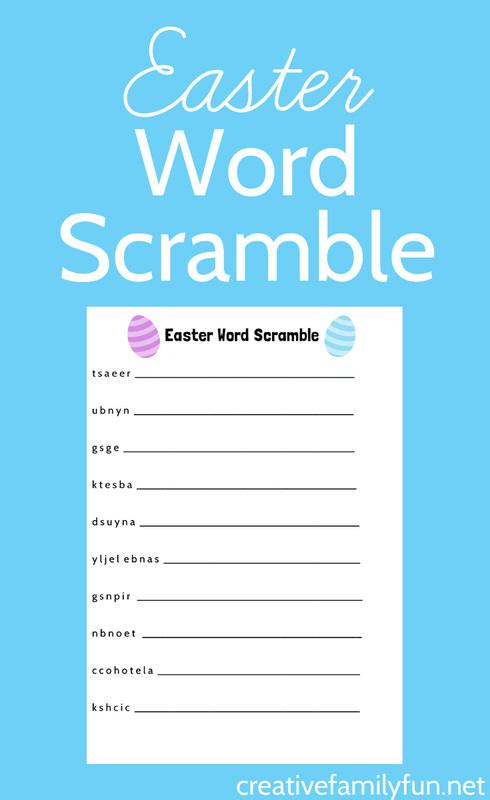 I created this Easter word scramble printable with ten words that describe Easter. You’ll find the words bunny, eggs, basket, Sunday, jelly beans, spring, bonnet, chocolate, chicks, and of course, Easter. How long to you think it will take to unscramble all the words? If you’re ready to solve the puzzle, use the link below to download and print your Easter word scramble. For your convenience, I’ve also included a separate printable with the answers. Feel free to print as many as you need for all your family, friends, or students. Download your free word scramble here. Download the word scramble answers here. 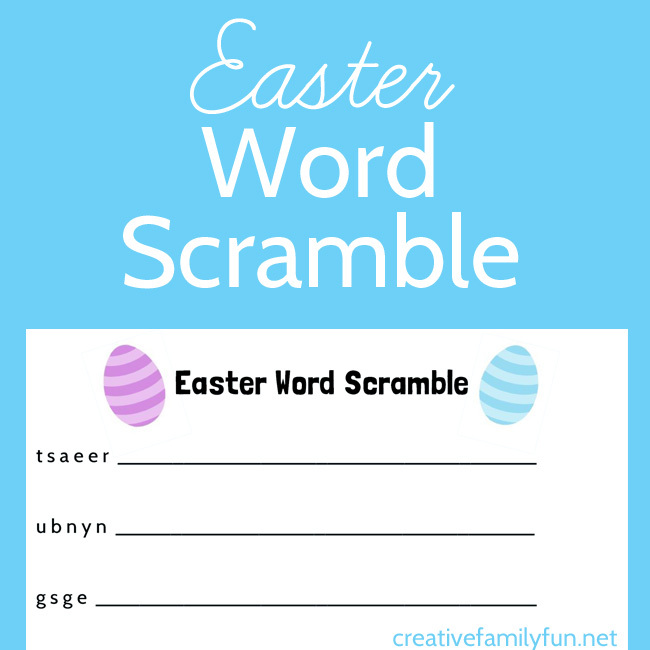 If you’re looking for other holidays, I’ve also got a Valentine’s Day Word Scramble printable and a St. Patrick’s Day Word Scramble printable you can download and print.